Volkswagen's Ferdinand Piëch really doesn't seem to 'get it'! 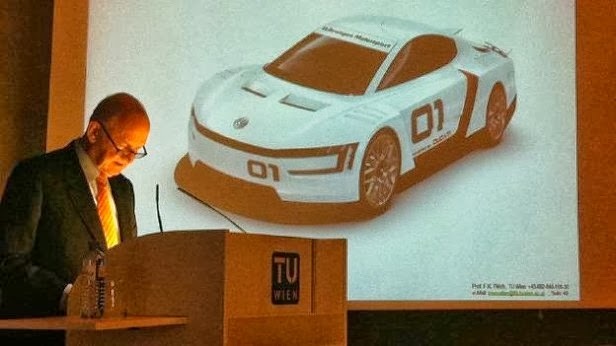 The chairman of the supervisory board at Volkswagen Group revealed during a lecture at the Vienna University of Technology that VW are working on a racing version of the XL1 to be powered by a 1.2 Liter two cylinder Ducati 1199 Panigale R superbike engine. Instead of ditching the XL1's 47 hp two-cylinder diesel engine and showcasing their recently launched EV strategy by installing a high performance 200 kw electric motor into the low drag carbon fiber XL1 chassis, something that might give a Tesla Roadster a runs for it's money, Piëch is attempting to reverse technical evolution and take a huge step backwards by off-loading the XL1's hybrid system entirely. Not only does the 190 hp / 123 Nm Ducati motorcycle engine have less power and torque than a standard Tesla Roaster, and significantly less than a Roadster Sport (300 hp / 400 Nm) but the V-Twin's peak torque is at 9,000 rpm instead of full torque from zero rpm like the Tesla. While the XL Sport (795 kg) may have a weight advantage over a Roadster (1,235 kg), it'll still be significantly slower 0-100 km/h and will be about as technically advanced mechanically as a motorcycle engine powered Locost Britsh kit car, or even the Piontek Sportech kit car chassis the Tesla powertrain was originally developed in.